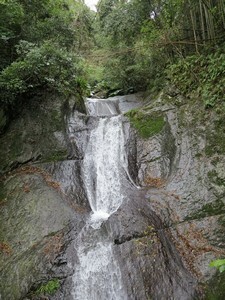 From Taipei, we will travel deep into the mountains of Fuxing Township in neighboring Taoyuan County. The residents of this tribe are mostly from the indigenous Atayal tribe and many make their living farming. Thus, the landscape includes majestic mountains, rural scenes and cultural elements. In addition, we will be traveling along the sometimes narrow and winding, but always picturesque, Northern Cross-island Highway. This highway connects Taoyuan and Yilan counties. It is popular among cyclists, as there are now faster thoroughfares for vehicles to travel between northern and northeastern Taiwan. Our first stop will be the indigenous Gaoyilan Community. 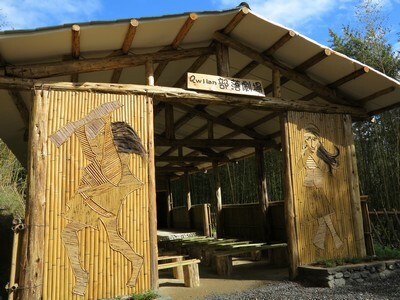 Here, you will be transported along farm roads to a parcel of land set aside for reviving Atayal hunting traditions. Visitors will be introduced to various traditional traps and snares and have the opportunity to try their archery skills before completing a several hundred meter trail to the Gulu Waterfall. Then, it is time for a lunch made using locally grown ingredients before heading on to Lala Mountain. 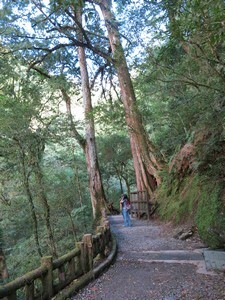 We start the day by walking among giants, giant cypress trees that is, in the Lala Mountain Nature Reserve. 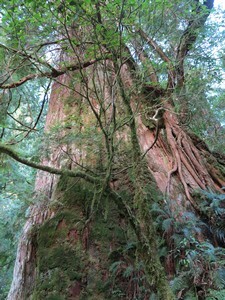 There are about two dozen trees to visit, some more than 2,000 years old. Most of the 3.3-kilometer trail is fairly flat with some stair climbing. It is suited to persons of average physical fitness. Then, it is time for lunch featuring locally grown fruits and vegetables. Following that, we continue to enjoy the mountain scenery along the Northern Cross-island Highway, as we head to the Cilan Forest Recreation Area in Datong Township of Yilan County. 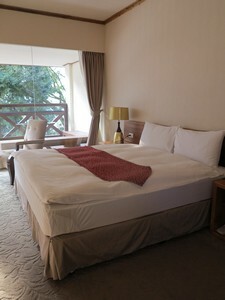 Accommodation: Qilan Villa or equivalent. After spending the morning finishing our exploration of the Cilan Forest Recreation Area and learning about Atayal culture at the Atayal Life Museum, we head to Songluo Village of Datong Township to enjoy a lunch of indigenous Atayal cuisine. 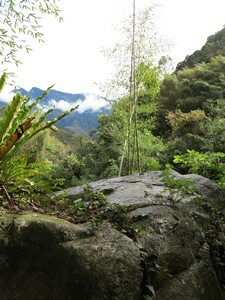 We then visit a nearby hillside tea planation and sample the locally grown tea amid panoramic mountain views. The trip back to Taipei will take us through the Xueshan Tunnel (the fifth longest tunnel in the world--12.6 kilometers) to arrive at about 6:30 p.m. The owner’s father began a peach orchard in this area and eventually developed a place for overnight guests traveling to Lala Mountain. 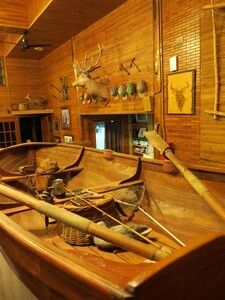 The decor is very rustic with copious amounts of wood inside and outside. There are also wooden decks and balconies for admiring the mountain views. 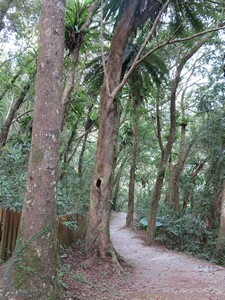 A nature trail runs along the back of the property and includes an area of bamboo forest. 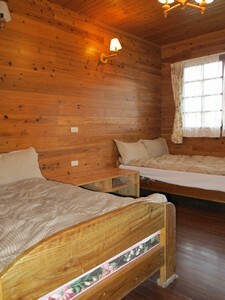 This resort is comprised of a main building with European-style rooms and an area with wooden cottages. In addition to its dining facilities, there is a veranda with a coffee bar that offers panoramic views of the surrounding mountains and riverbed. 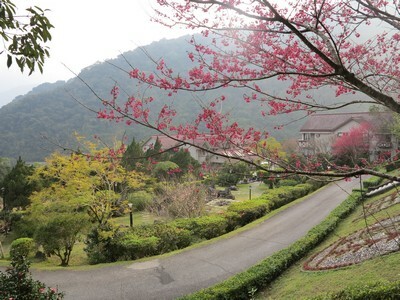 Most importantly, this resort is located within the Qilan Forest Recreation Area with easy access to a number of picturesque nature trails. Fuxing Township is a large, mostly Atayal area in Taoyuan County comprised of 10 villages and more than 30 indigenous communities. In the summer months, this area comes alive with the peach harvest. But, actually fruits and vegetables are produced year round. It is also known for the Shimen Dam, and its associated reservoir, along the Dahan River. The dam was built in 1964 and without warning forced indigenous residents to flee their homes as their villages became inundated with water. This part of the township’s history, as well as heavy sedimentation in the reservoir and other issues, is a sore spot for residents here. This community’s development association has been working over the past few years to develop tourism opportunities. Visits usually start with a ride in a covered or uncovered farm truck for about 10 minutes along narrow roads with sharp turns. This brings you to the entrance of a trail that extends a few hundred meters through the hunting grounds of two Atayal clans. 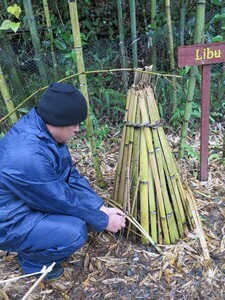 Along the way, a local guide introduces a variety of traps and snares used to catch mice, birds, monkeys and wild boar. Then, visitors can step onto an observation platform to admire the Hnuway Stream. After that, they can test their archery skills using replicas of wild boar before completing the trip to the Gulu Waterfall. Other activities may include village tour, performances in the village’s theater, DIY handicraft making and swimming in the Hnuway Stream. “Lala” means “beautiful” in the Atayal language and this place certainly is. This is part of the Upper Baling Community of Fuxing Township in Taoyuan County, “baling” being a transliteration of the Atayal word for “giant trees”. This basically sums up the Lala Mountain Nature Reserve. 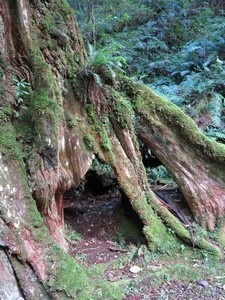 There are 24 old Taiwan cypress trees aged between 500 and 2,800 years. 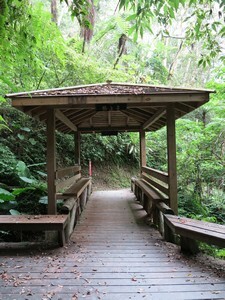 Each is numbered and can be reached from along a 3.3 kilometer trail. This township is located in southwestern Yilan County. 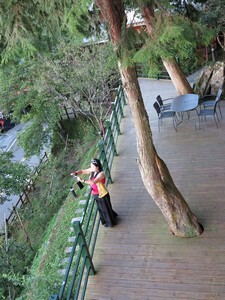 It is a mountainous area and although not far from Yilan City and even Taipei City, with the opening of National Freeway 5 and the Xueshan Tunnel, several aspects of indigenous Atayal culture have been preserved. Moreover, this township is blessed with many trails, rivers, ecological areas and forest recreation areas. This forest recreation area was one of late President Chiang Kai-shek’s favorite vacation spots and he had a chateau built here, which still stands. Visitors can enter the chateau and see how it was decorated by the President and First Lady and view historical photographs. This forest recreation area includes several nature trails, the most challenging of which is the Forest Shower Trail, a 2.1 kilometer loop. This trail is quite steep in some places but is well maintained with sections of wooden steps and gravel paths. Highlights include wooden bridges, a Chinese-style pavilion and a complex of empty and neglected wooden buildings that date back to the recreation area’s establishment some 25 years ago. There are also trails for admiring flowers that blossom throughout out the year and it is very possible that you will see Formosan rock monkeys and other wildlife. The residents of Songluo Village include those of the Atayal tribe and Han Chinese. 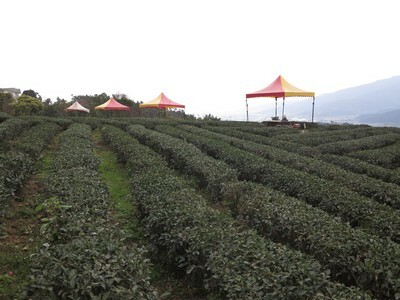 Many of the Han Chinese residents are involved in tea growing and offer covered pavilions amid rows of tea plants for simultaneous enjoyment of the locally grown tea and panoramic views. As this village is surrounded by mountains it also offers the opportunity for ecotourism activities such as hiking the 2.4-kilometer Songluo National Trail, which is maintained by the Songluo Community Development Association. This was once an Atayal hunting path, and is now a place for environmental conservation and education. It is mostly gravel path for the first kilometer. 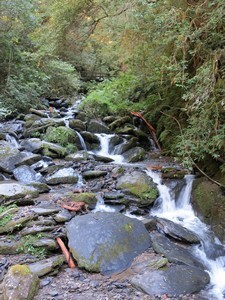 After crossing the Songluo River on a single file suspension bridge, there are rocks to cross and the scenery is of pristine forest. This trail has mostly gradual slopes and is suited to persons of average fitness. This is the best place to start your exploration of this township. There are exhibitions on the geography and topography of the township, as well as on its ecology. A model of the township shows the layout of the various attractions. 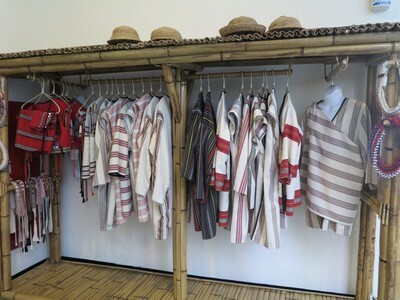 There are also exhibitions on various aspects of Atayal traditional culture. 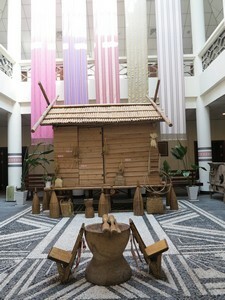 Visitors can try on indigenous clothing and have their picture taken in front of a traditional style granary and using various props such as a chair used by a groom to carry his bride and pestle and mortar. The gift shop is a cooperative of local handicrafts workshops. Each day, the staff of one of the workshops is responsible for running the gift shop.